Just one evening in autumn 2008 we rediscovered our shared love for Yu-Gi-Oh!. We thought about how to cosplay our favorite characters, because other than Games or real life cosplay, it's really different to translate the hairstyles and appearance of Yu-Gi-Oh! Characters into real life wihtout looking utterly fake and stupid. Marik was not that big of a problem and Ryou Bakura was also very fun to style! The costumes were sewed rather fast :). 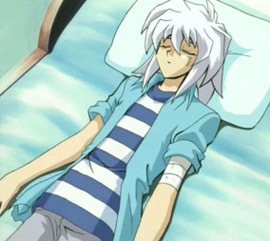 It was bitchy though to put the Bakura shirt together from blue and white fabrics. But I didn't want to buy one because it wouldn't look like the original. Building the items was rather new for us but we somehow managed. Sadly Kayleigh destroyed my ring accidentally in winter, but it's almost rebuilt now (thanks to Julian's help with the pendants ^___^). 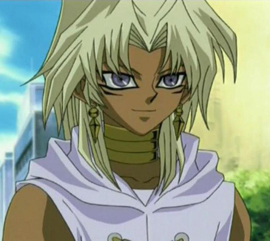 I was wondering how you styled your Marik wig, I've been looking for one, to no avail, nor have I been able to find a single tutorial on how to style one to look like it T_T please help!! YuGiOh!! 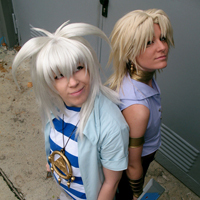 - Marik & Yami Bakura Cosplaying as Yami Bakura and Marik for Animaco. We had a wonderful time at a contest and shootings. 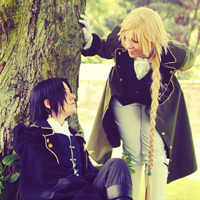 Pandora Hearts - Jack & Glen (Oswald) Back during their first friendship years, Jack had different outfits and Majin liked this one better than is original one. So she had to do it. Final Fantasy XV - Noctis Lucis Caelum Tenebrae A photoshooting with young Noctis and a lof of blue flowers and sunrays!